Kevin Anderson falls on the court in the midst of a breathtaking, ongoing rally, but doesn’t break the rhythm. In fact, he ends up intensifying the game further. After the fall, he gets back up in the nick of a nanosecond, and hits back with a left-handed stroke! And if you think this was just action with no more juice to it, get this - he goes on to win the point AND the game. The break proves to be crucial as the South African manages to hold his serve in the next game and win the epic set 26-24. This is Kevin Anderson for you, the star of Wimbledon 2018 semi-final and now a Wimbledon 2018 finalist. Notice in this video how he almost falls on his back on the court with his racquet throw on his side, and then gets back up so smoothly to take on the rally with an impressive left-handed stroke, like nothing even happened before. 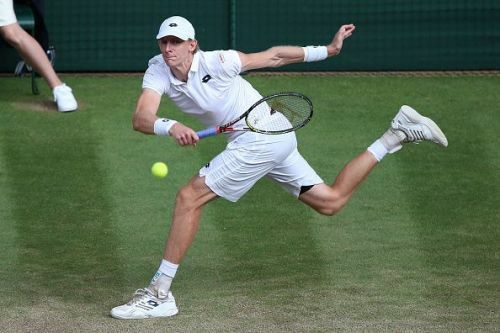 Kevin Anderson couldn’t have asked for a better set up to prove the point- you’ve got to fall to be able to rise again. He and John Isner played the second longest match of all time in Wimbledon history yesterday. 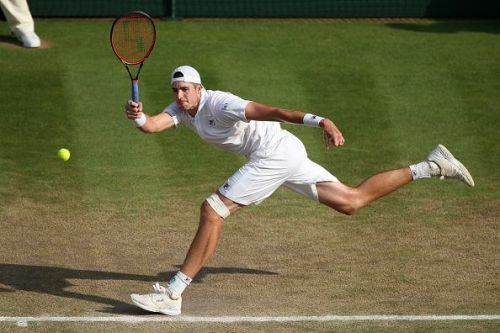 In our yesterday’s preview story on what to expect from Wimbledon’s Day 11 match, we talked about how Isner and Anderson are real-life stories of persistence, patience, and truckloads of sweat. And during the match, they displayed these attributes without a hurdle. And the hurdle (the Anderson fall) that did show up, was overcome like it was No. Big. Deal. Based on this semi-final's action, we truly believe that Anderson fall should be a term used for people who embrace the fall wholeheartedly, and get back up to do some serious winning in life! John Isner was no less of a hero, either. He gave Kevin Anderson the constant fight that turned out to be a memorable marathon. Clearly none of them gave up till the end, but as they say, the one who emerged a better man in the crucial moment in the game, won the game. In this intense test of endurance, Anderson beat Isner (8-6) 6-7 (5-7) 6-7 (9-11) 6-4 26-24 in six hours and 36 minutes. Fun fact - Anderson-Isner semi-final, proving to be the second-longest in Wimbledon history, didn’t leave enough time for Djokovic-Nadal to finish their game. Because of 23:00 pm curfew and the previous marathon, the two couldn’t even get to the court before 20:00 pm. The match suspended after the third set following a gripping tiebreaker and will resume today on Day 12.